Tales of the “Wild West” abound in our cultural imagination, especially when it comes to robberies. Jesse and Frank James, Billy the Kid, and the Dalton Gang are just some of the famous examples from history. 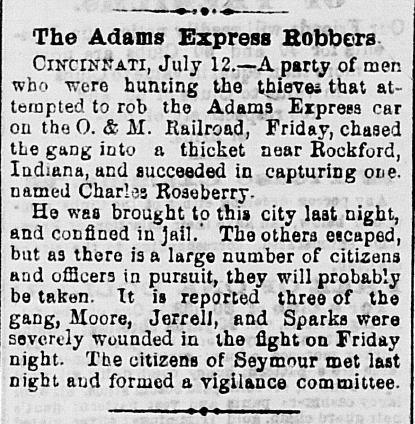 However, one of the “Wild West’s” earliest and most infamous robbery syndicates was not from Texas or Arizona— but from Jackson County, Indiana. The Reno Gang, often credited with the “first train robbery in America,” were a gang of outlaws that roamed the Indiana and Missouri countryside in the 1860s, stealing loot from banks and county treasuries. At their peak, the Renos and their copycats stole nearly half a million dollars within a span of two years. The gang’s core consisted of four brothers—John, Frank, Simeon, and William Reno—alongside a cadre of counterfeiters, ruffians, and petty thieves. While their crimes became legendary, the community’s response proved equally legendary. Local sheriffs, Allan Pinkerton’s men, Canadian detectives, and the Jackson County Vigilance Committee all stove to exact justice on the Renos and their accomplices. In this blog, we will uncover the trail of destruction left behind, not only by the Reno Gang, but by those who punished them. Our story begins with a sprawling family in a small Indiana town. Wilkinson Reno, the patriarch, arrived in Jackson County as an upland southerner from Kentucky. He and his family settled on a 1,200 acre farm in Rockford, a town slightly north of Seymour. “Wilkes,” as he was called, married Julia Ann Reno in 1835, “a woman sprung from the Pennsylvania Dutch.” They had six children; five boys (Frank, John, Simeon, Clint, and William) and one girl (Laura). Clint never involved himself in his brother’s criminal activities, which gave him the nickname “Honest” Reno. Laura proved more of a sympathizer than an accomplice and defended her brothers’ honor her entire life. Growing up, the boys caused trouble by “playing crooked card games to bilk travelers” and allegedly involving themselves in a series of town fires. 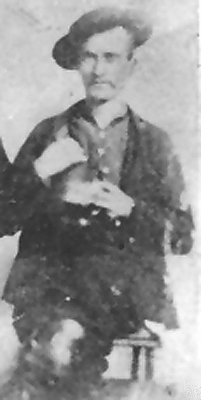 During the Civil War, some of the Reno brothers gained a reputation for “bounty jumping,” joining the army for recruitment money, deserting the post, and pocketing the cash. While this seems bad enough, the Reno brothers were just getting started. After the war, they returned to Rockford, formed a gang with other bounty jumpers, and carried out a series of petty robberies in the community. 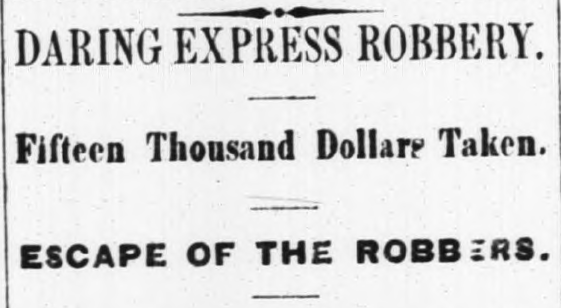 However, they took their thievery to the next level by “blowing a safe at Azalia, Bartholomew County, Indiana, by which they got $10,000.” This all culminated in the first major robbery of the Reno Gang’s Career: the Ohio and Mississippi express robbery. 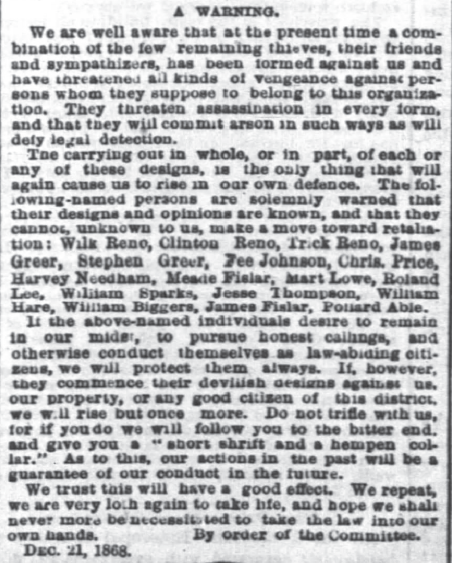 Indianapolis Daily Herald, October 8, 1866. Hoosier State Chronicles. 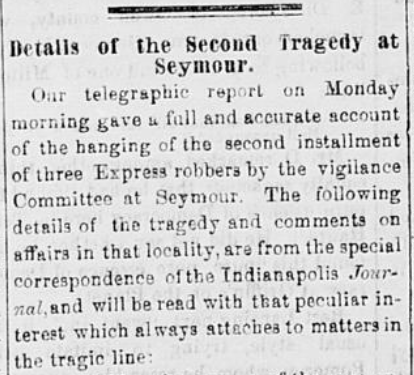 Indianapolis Daily Herald, October 16, 1866. Hoosier State Chronicles. 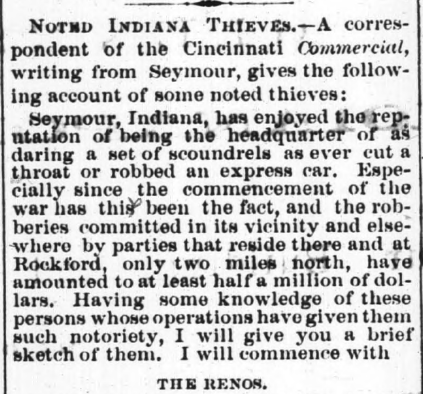 Indianapolis Daily Herald, November 13, 1866. Hoosier State Chronicles. Despite the warnings, country treasuries felt the wrath of the Reno Gang into the spring of 1867. Ripley County’s treasury lost $500 in a break in, but fortunately, the inner safe kept and saved $30,000 from being lost. DeKalb and Jackson counties proved more successful for the Renos, where their treasury break-ins resulted in $70,000 worth of stolen assets. The Journal published another warning to country treasuries, pithily commenting that “the funds on hand would be as secure if thrown into an empty box or barrel in the treasurer’s office, as they are in what are facetiously termed fire-proof and burglar-proof safes.” The Renos and their accomplices caused much trouble, but their copycats proved to be the beginning of the gang’s unraveling. Indianapolis Daily Journal, March 16, 1867. Newspaper Archive. 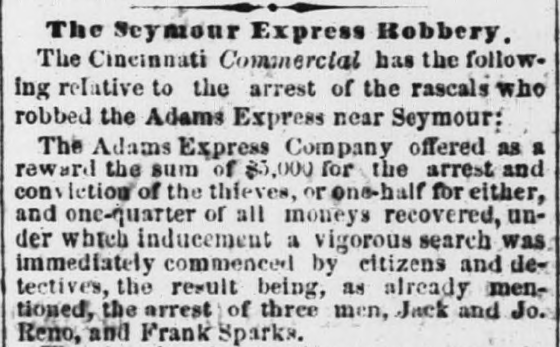 On September 28, 1867, copycats Walker Hammond and Michael Colleran robbed the Adams Express on the Ohio and Mississippi railroad, almost a year after the Renos’ attempt, and made off with $10,000. Hammond and Colleran, while successful in their robbery, were not successful in their escape. The Renos knew their plans and watched the hold-up from afar, and as the copycats attempted their getaway, the gang cut them off and “relieved the robbers of their plunder.” In an even brasher move, the Renos left Hammond and Colleran to the authorities, where they served time while the gang got away with their cash. This appeared to be the last straw for the community and for the Adams Express Company. 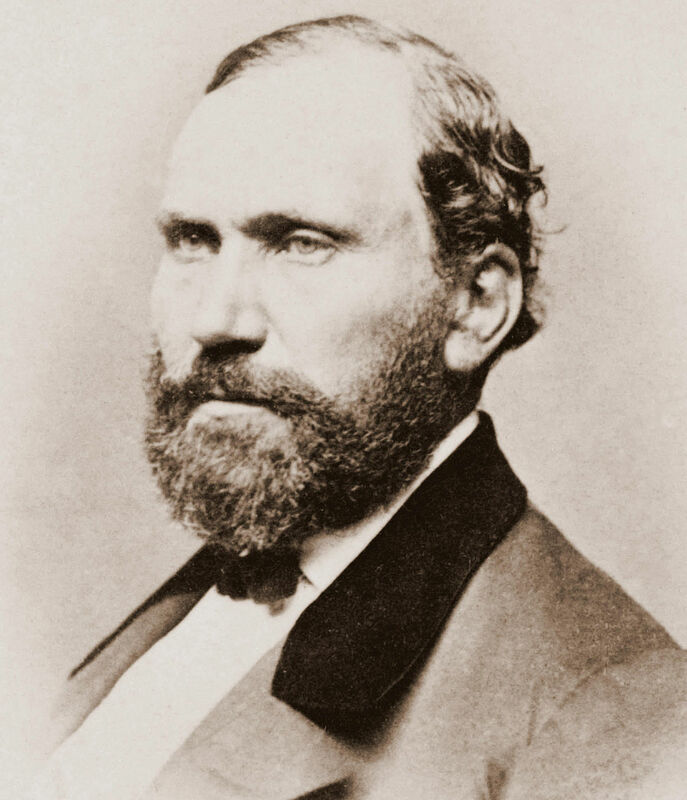 As a response to constant terror, Adams Express employed Allan Pinkerton, the famous private detective, and his agents to hunt down the Renos. Jackson County locals also formed their own vigilance committee, hoping to exact their own brand of justice on their community’s most notorious criminals. Some of the gang began to feel the heat. John Reno and Frank Sparks fled to Missouri, where they carried out another series of robberies in Daviess County. 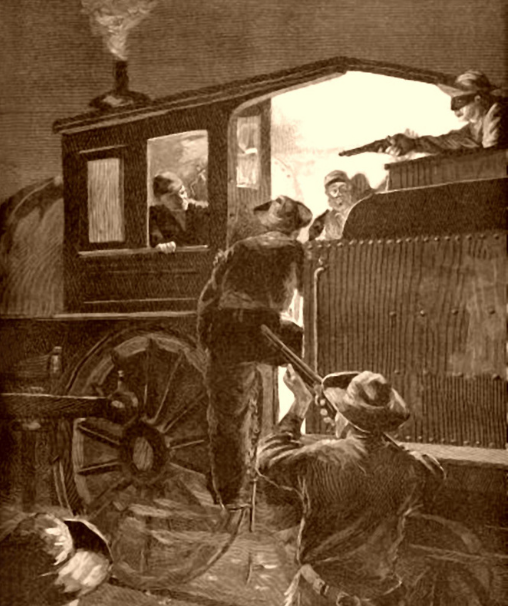 Upon returning to Indiana, Pinkerton and his men surrounded Reno’s train in Indianapolis and arrested him. Sparks was also arrested near Seymour. Authorities sent John Reno back to Daviess County where he faced charges of safe robbing and summarily sentenced to twenty-five years in prison. His days with the Reno Gang were over. The Holt County Sentinel, December 13, 1867. Chronicling America. While the train was thus watering on Friday night, six men approached it suddenly, and at once commanded an assault on the engineer and fireman, with a view to the capture of the engine. . . .One of them struck him [the messenger] a terrible blow with one of the crowbars over the right side of the head, crushing in the skull and inflicting a terrible wound transversely from near the top of the head to the temple. . . .This done, the robbers at once commenced their work. All the safes were either broken open and robbed, or thrown overboard at designated places to be robbed by confederates of the six on the train. They were most likely robbed, however, before they were thrown off the car. An artist rendition of the Reno Gang. Legends of America. Terre Haute Daily Express, July 13, 1868. Hoosier State Chronicles. The Terre Haute Daily Express reported that “A party of men who were hunting the thieves . . . chased the gang into a thicket near Rockford, Indiana, and succeeded in capturing one, named Charles Roseberry.” It is likely that the “party of men” described in the piece were Pinkertons, because they brought Roseberry into town for medical treatment and questioning. Gang members John Moore, Henry Jerrell, and Frank Sparks also suffered intense injuries. Indiana Daily State Sentinel, July 14, 1868. Hoosier State Chronicles. Terre Haute Weekly Express, July 22, 1868. Hoosier State Chronicles. Terre Haute Weekly Express, July 29, 1868. Hoosier State Chronicles. [On July 25], . . . seventy-five men noiselessly surrounded the wagon, overpowered the night guards, and in turn placed them under surveillance; the wagon was driven back under the fated beech, and in less time than it takes to tell it, upon the same three limbs [as the others], Frank Sparks, Henry Jerrell, and John Moore ended their lives of crime. Indianapolis Daily Journal, July 27, 1868. Newspaper Archive. 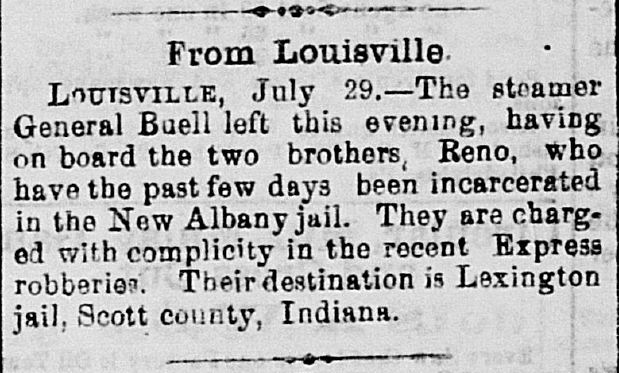 Within days of the second lynching by the vigilance committee, Simeon and William Reno were arrested in Indianapolis, subsequently jailed in New Albany, and transferred to the Lexington jail in Scott County. Authorities rightly believed they would be safer there than in Jackson County. The criminal career of the Reno gang crept closer to a conclusion. Terre Haute Daily Express, July 30, 1868. Hoosier State Chronicles. New York Times, August 12, 1868. Newspapers.com. 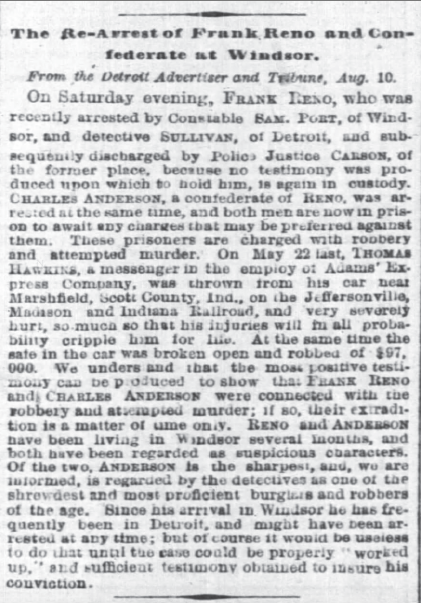 Meanwhile, Windsor Constable Sam Port and his team finally arrested Frank Reno and associate Charles Anderson for the robbery of the Adams Express and the attempted murder of its messenger, Thomas Hawkins. Upon arraignment, the courts dropped the initial charge of attempted murder against Hawkins, mainly from a lack of evidence. However, they were re-arraigned on another charge: the assault and attempted murder of Americus Holden, the conductor of the Adams Express. 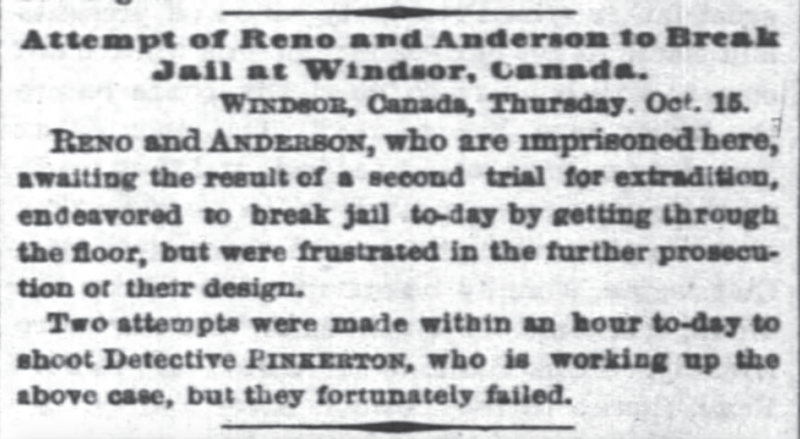 Chief Justice William Henry Draper, upon reviewing the evidence and arguments for this new charge, ruled in favor of the state and ordered Reno and Anderson to be extradited to the United States and tried there. The two criminals, possibly weary of what awaited them back home, attempted to break out of jail. Unluckily for them, Detective Pinkerton and his men prepared for the thieves’ antics, endured two failed assassination attempts, and successfully carried out their charge by the US Government to bring them back to the states. New York Times, October 16, 1868. Newspapers.com. 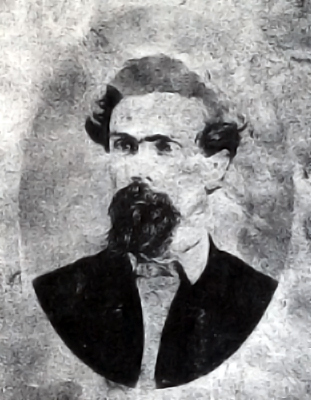 As Pinkerton and his men brought the two fugitives back to Indiana, the Jackson County vigilance committee sought to continue their own brand of justice. In mid-September of 1868, the vigilance committee caught word that Simeon and William Reno were jailed in Lexington. A cadre of “eighty-five men” traveled from Seymour to Vienna, made the eight mile trek to Lexington on foot, and barnstormed the local jail. However, the Renos were not there. That did not stop them from trying. 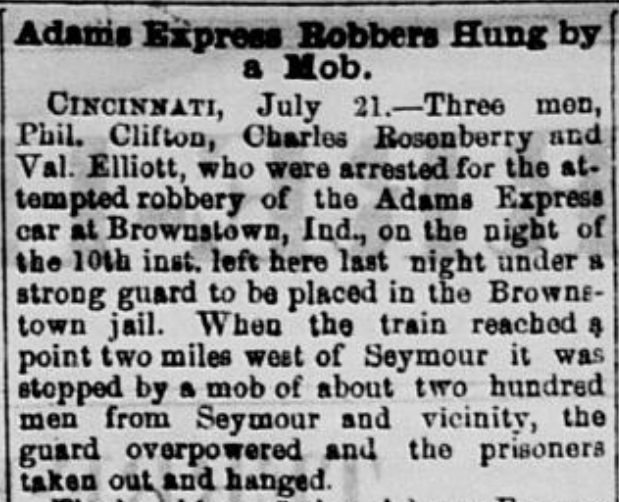 A messenger altered the mob that the brothers might be traveling by train. Some of the mob stayed in Lexington while the others stayed in Vienna. “When the train arrived, consequently, about six o’clock A.M.,” the Daily Sentinel noted, “the platform of the depot was crowded with strange men, whose faces were unfamiliar to the citizens of the village and passengers on the cars.” They searched the train and found that the Renos were not on board; sensing a problem, local law enforcement returned the prisoners to New Albany. Discouraged, the members of vigilance committee in Vienna took another train home to Jackson County. The Renos escaped their clutches, one last time. Indiana Daily State Sentinel. December 14, 1868. Hoosier State Chronicles. By December, Frank Reno, Simeon Reno, William Reno, and Charles Anderson all faced trial for their crimes. Prosecutors tried them in New Albany in an attempt to stave off the vigilance committee. Despite all the precautions and stop-gap measures the local authorities took to stop the bloodshed, the vigilance committee got exactly what they wanted. 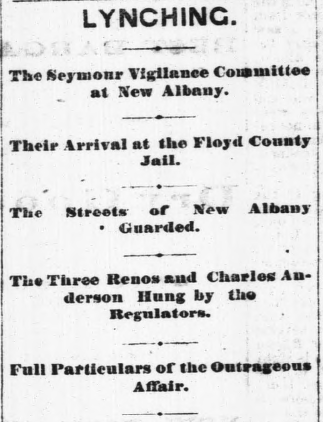 On the night of December 12, “sixty to seventy Seymour Regulators, masked and heavily armed” walked out of the New Albany station of the Jeffersonville railroad and proceeded toward the jail house. They barged in, demanded the keys from the sheriff, and completely surrounded the premises. Frank Reno “fought the regulators, knocking three of them down,” but was beaten to a pulp. William and Simeon also tried to fight them off but to no avail. Anderson, sensing the end, asked if he could say a prayer but was denied. The mob hung all four men within an hour, commandeered a train, and left by four in the morning. 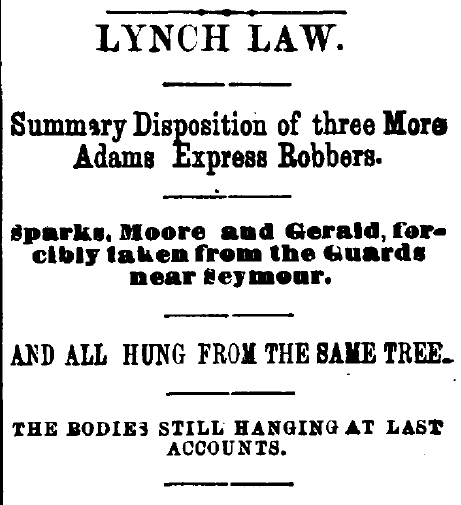 “Lynch Law in Indiana.” Harper’s Weekly, January 2, 1869. Internet Archive. 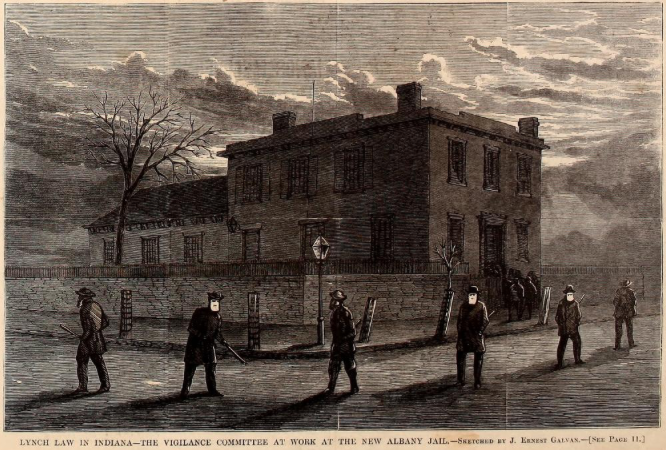 This lithograph depicts members of the vigilance committee surrounding the New Albany jail. New York Times, December 26, 1868. Newspapers.com. 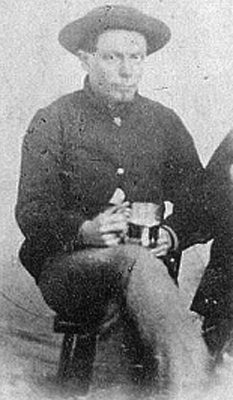 John Reno, the last surviving brother of the gang, finished his prison sentence in February of 1878, after receiving a commutation by Missouri Governor Benjamin Gratz Brown. After his release, Reno spoke to the Indianapolis News about his future. “I’m a rattling good stonecutter . . . and have put up a shed in Seymour, where I intend to go to work,” he said. Unfortunately, stone cutting was not the only work he was doing. 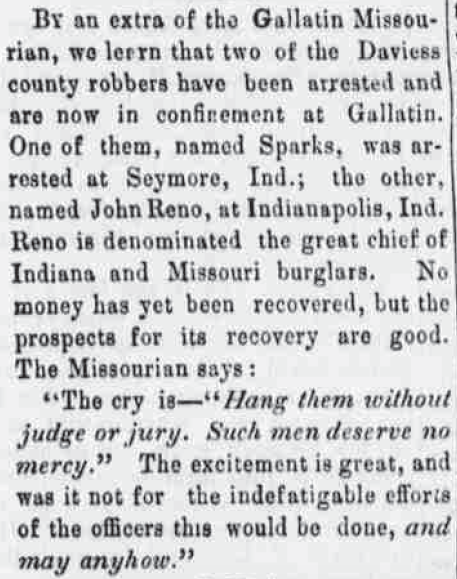 Reno went back to prison in 1885 for “passing counterfeit money in Indianapolis” and served another three years. Little is known of what happened after his second release from prison. He died in 1895. With his death, the Reno Gang finally gave way to legend. 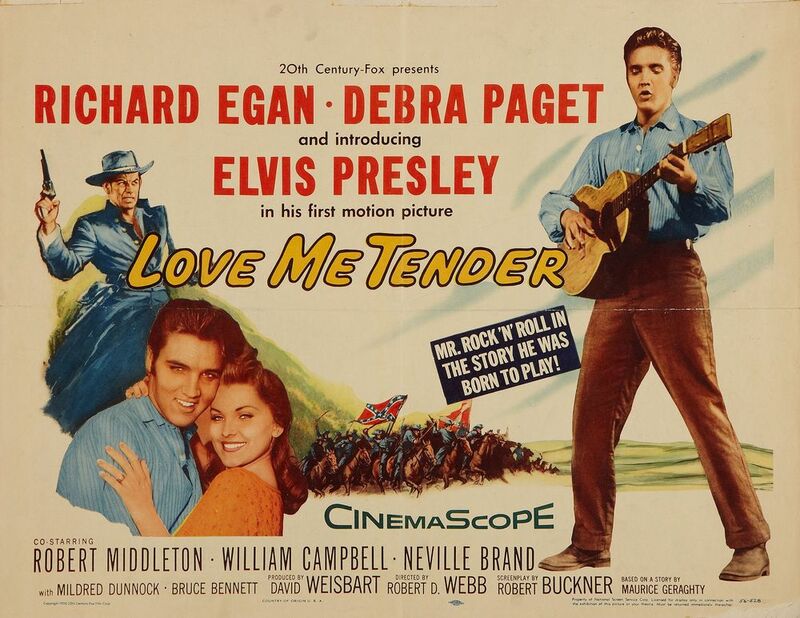 Half Sheet poster for Love Me Tender, 1956. Elvis Worldwide Movie Memorabilia. In his first feature film, Elvis Presley played Clint Reno. The Reno brothers and their gang perpetuated a crime wave in Jackson County the likes of which had never been seen. 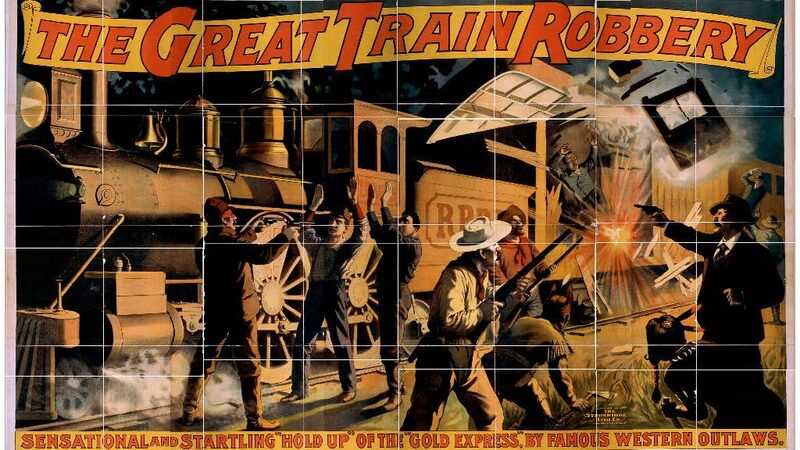 Their infamous status served as an inspiration for the pioneering short film, The Great Train Robbery (1903). It also directly inspired two feature films: Rage at Dawn (1955), starring Hoosier Forrest Tucker as Frank Reno, and Love Me Tender (1956), with Elvis Presley as Clint Reno. However, in a historical sense, the Reno Gang’s story is more than just the films it inspired. At its heart, these men were some of the first modern criminals in American history, using technology and organization to steal great fortunes with skill and ease. Law enforcement appeared wildly unprepared to handle them. As a result, a vigilance committee took justice into its own hands, committing horrible violence against the gang and leaving order up for grabs. In their eyes, the law couldn’t contain men like the Renos, so they had to do it themselves. 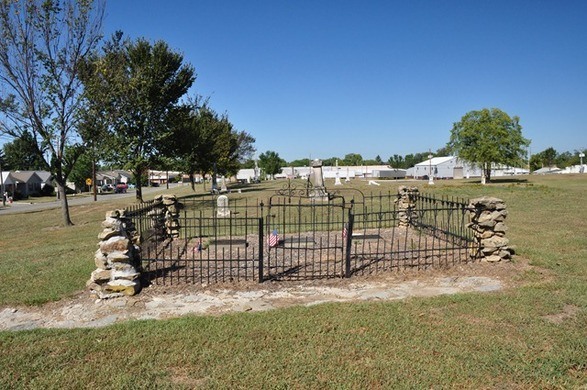 The graves of Frank, Simeon, and William Reno, Cemetery Park, Seymour, Indiana. Atlas Obscura.